Do you have a retail chain ? Connect your shops online with expertAccounts ! 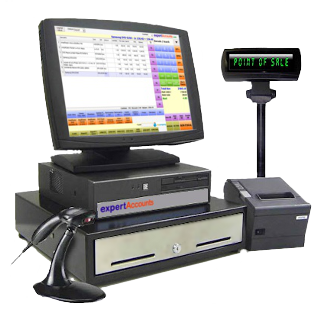 The POS System purpose is to help you make quick and accurate sales. It removes human errors, and you can control in real time everything that happens in your shop, with expertAccounts.com Cloud ERP. Moreover, it helps you build a PREMIUM shop image. As for the hardware, for a POS, you need 4 elements: a computer, a monitor (eventually with touchscreen), a barcode reader and a receipt printer. We can use a receipt printer with cash drawer that you already have in your shop, or a fiscal printer and optionally a cash drawer. The investment in hardware can be less than RM1000, using some refurbished items. If you already have a POS system, you can use the existing hardware for the expertAccounts.com POS system, and your shop will be connected to the ERP system from your headquarter, without any investment. Price rules, including promotions type “N+1 free”. The POS System can work in several ways: Online, with stock update in real time or at the end of shift. Offline (no internet traffic), with syncronisation by request or automatic at the end of shift. Customer Information Management System and loyalty cards. Management bonus points, discount points, integrated with the POS system. You can use anonymous cards for customers who do not want to give their personal information, or if you do not want to process personal data. Customer database can be used for sending special offers and newsletters, with the "CRM - Marketing" module. You can use a custom card for your business (with company logo and presentation) or you can use the cards in your wallet already has client. There are many customers who may have 10 different loyalty cards in their pocet and may be reluctant to take a new one from your company. The expertAccounts.com loyalty sistem cards allows you to use your own branded cards or other cards that our customer may have in his pocket, by reading the bar code. In practice, it scans the code on any card customer has in his wallet and the system will link to that new code the customer info. When your customer returns in your shop he can accumulate points or get a discount based on that card, which you scan at the POS System. After scanning loyalty card at POS, customer loyalty accumulates points and you may choose to give discounts based on the amount of points , redeem the accumulated points. Customized loyalty rules can be implemented.